Well, we have taken the plunge! Yes, we have bought our own Tuff Spot. I used these a lot in school so I’m looking forward to using one at home. 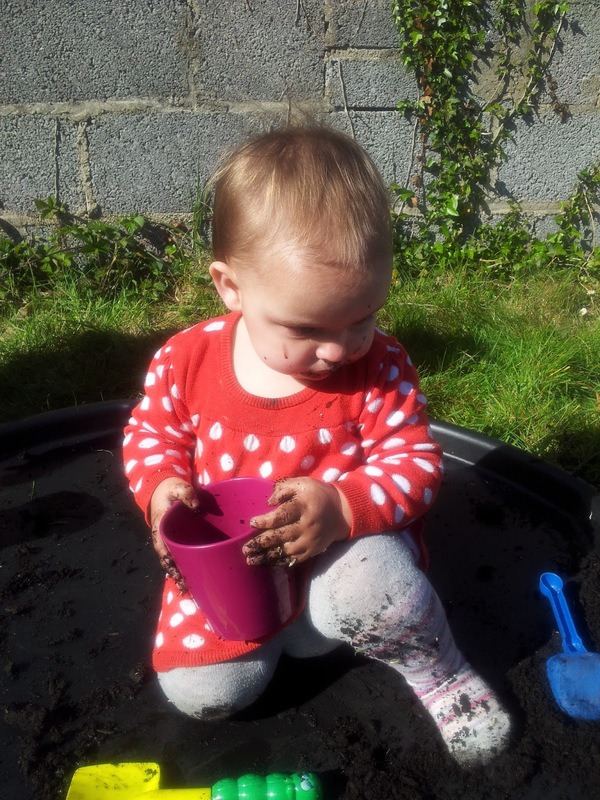 We had lovely weather this weekend and the older kids wanted to plant their tomato and sunflower seeds, I thought I would combine this activity with Messy Play for Izzy and keep all the kids of different ages happy at once. 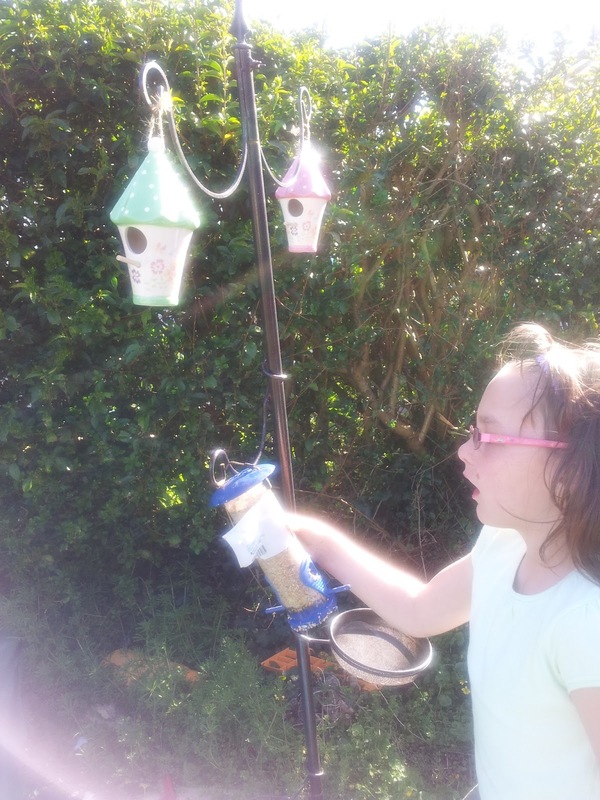 First, while we were out in the garden, we needed to refill our bird feeders. 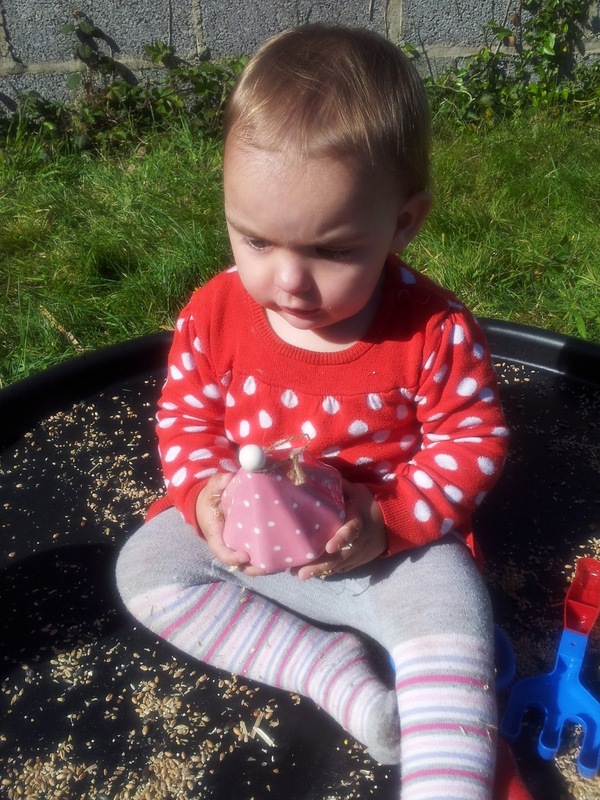 I let Izzy play with the seed, to feel it’s texture and she helped to scoop the seed up with her hands and into the feeder. 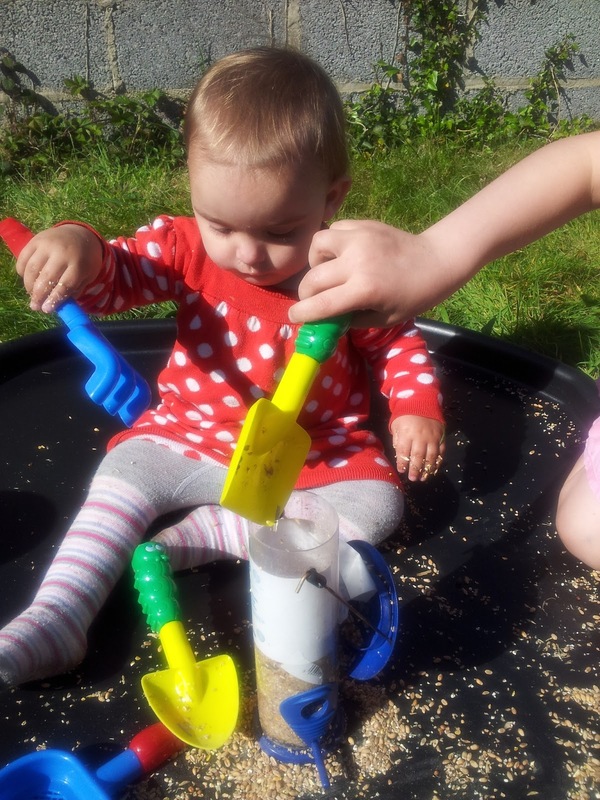 She also used her garden spade to help too. 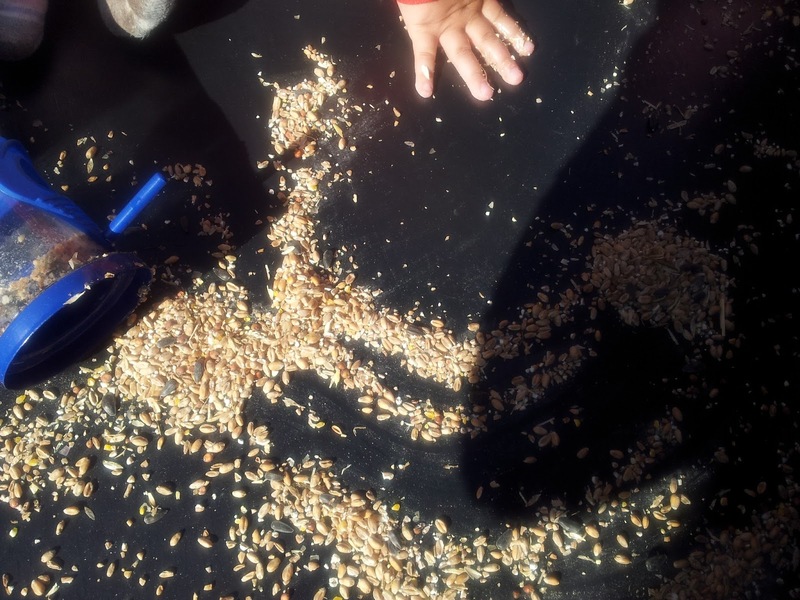 Most of all she loved spreading it all around her and making patterns in the seed. The bird feeder was washed before she filled it. She looked at our pretty birds house, that we also hang up. I pointed out birds nests to her and we talked about where “birdies” live. She pointed to the birds, flying and tweeting in the sky. 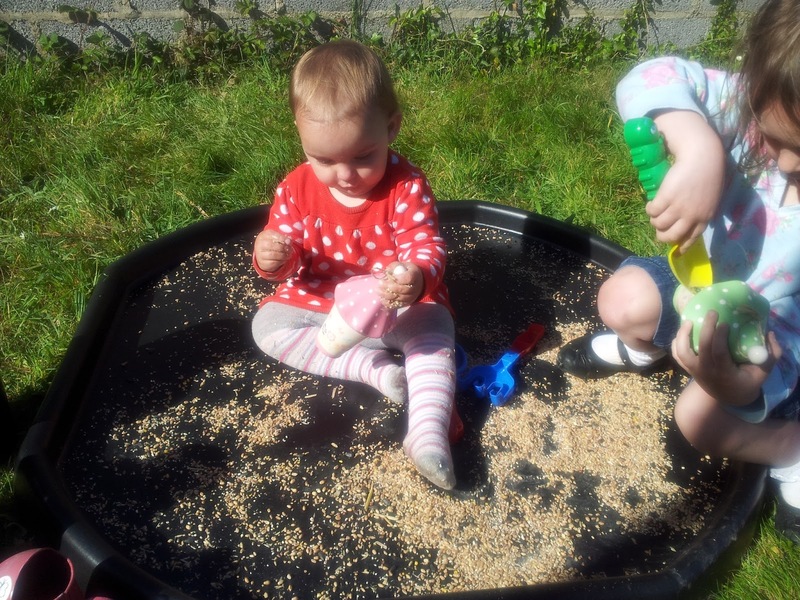 This has inspired me to do a “Birds nest” messy play with Izzy one day…oh the fun we could have with eggs in the “nest”! 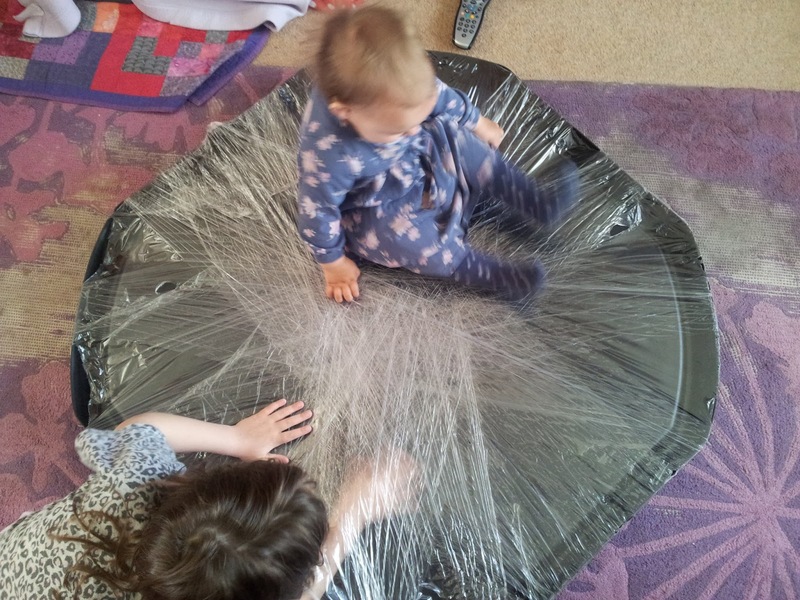 I love how in Messy Play, you can never be short of ideas, as one idea always runs into thousands others and your child or children will inspire you constantly. Then it was time to get the compost out. 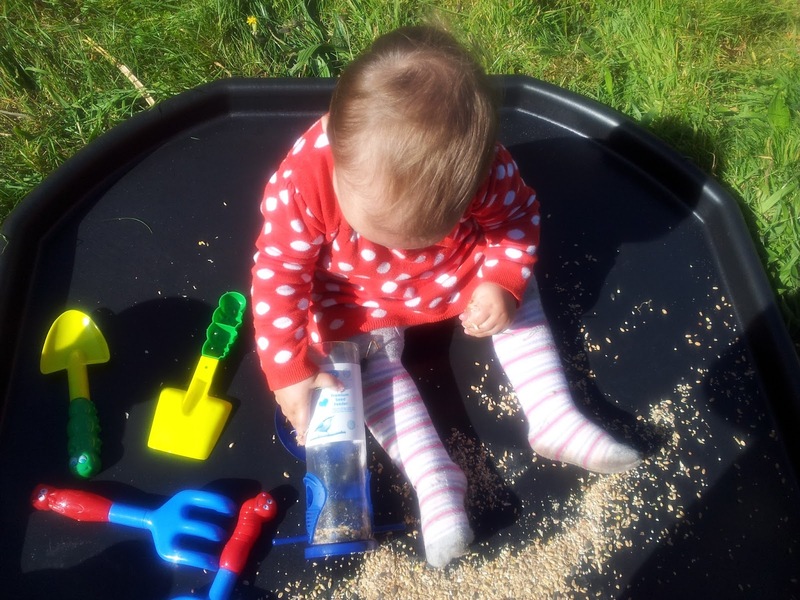 Again, she liked to spread it all around and sit in the soil. With a little bit of sunshine and water in the cans, we were growing an Izzy! 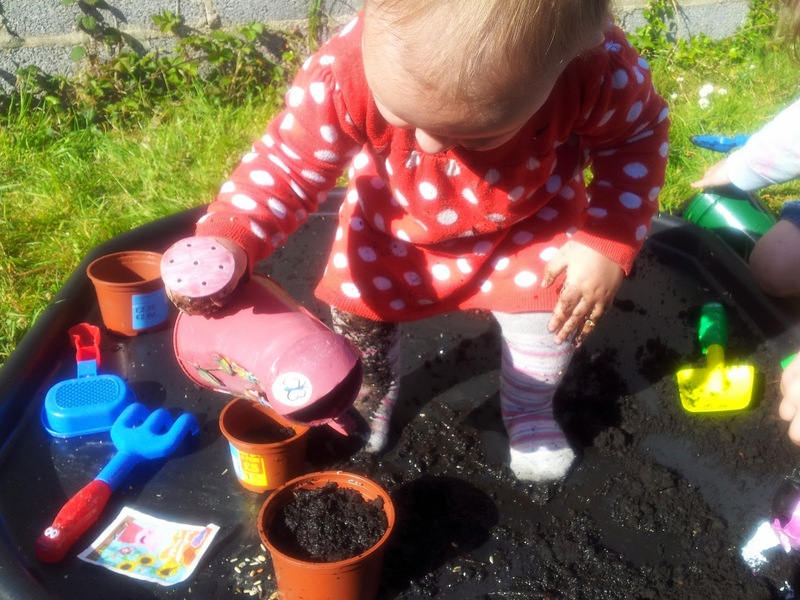 She helped to fill the pots again using her hands, spade or other containers. She did like emptying out the container once she had filled it, so I had to keep Danny, Rebecca and Caitlyn’s pots out of her way! 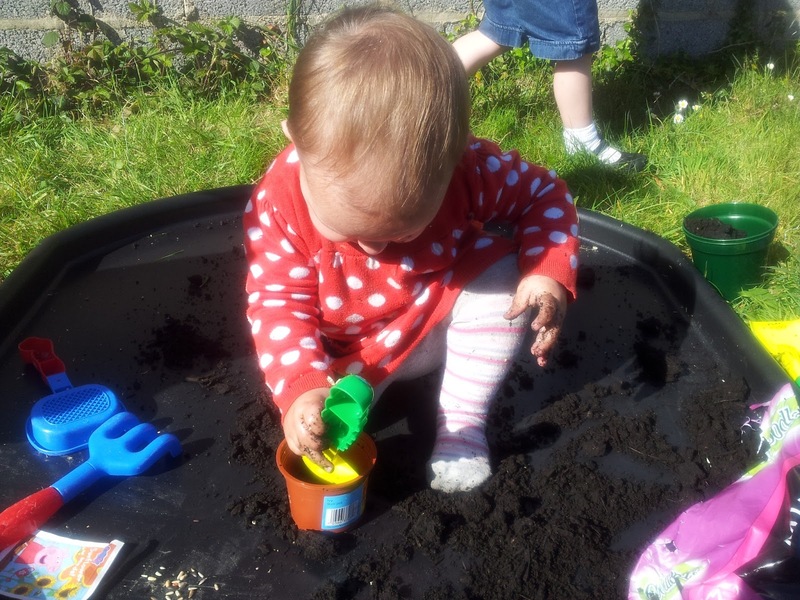 She loved looking through the pots, and shouting through the hole in the pot making funny noises. I think these photos prove that we are a happy, but potty family! I showed her the Sunflower Seeds and how to carefully make a hole for one using our pointy finger and then to place the sunflower seed. 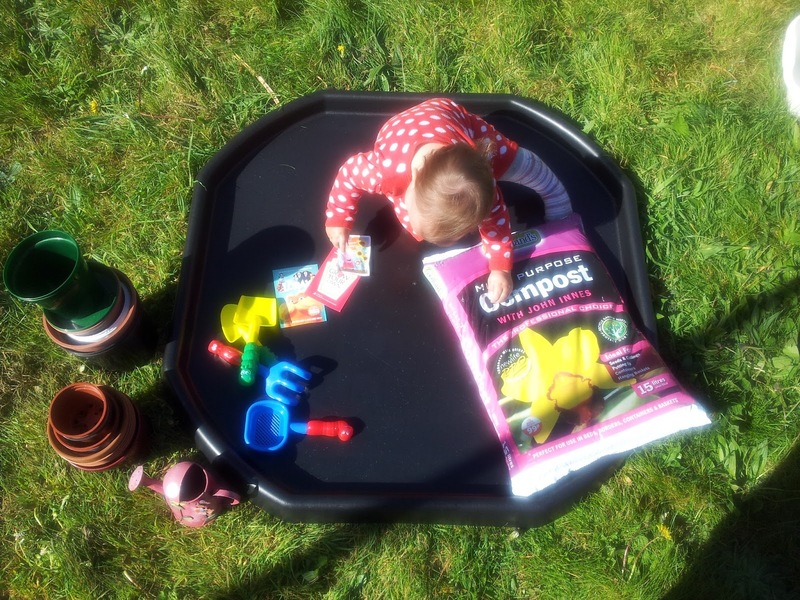 I encouraged her to sprinkle more compost on top. 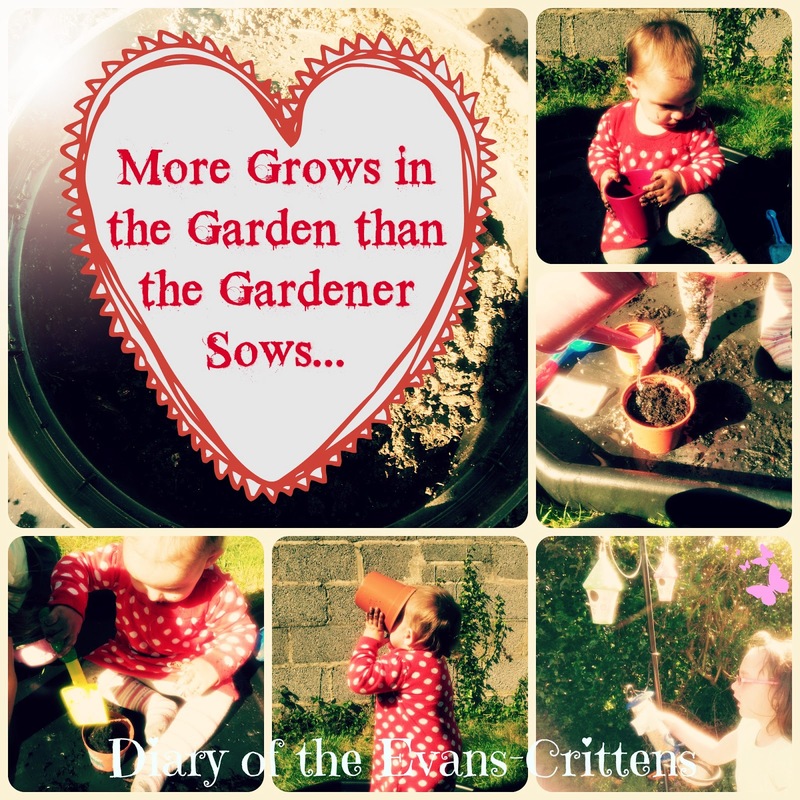 She then watered her seed in the pot. 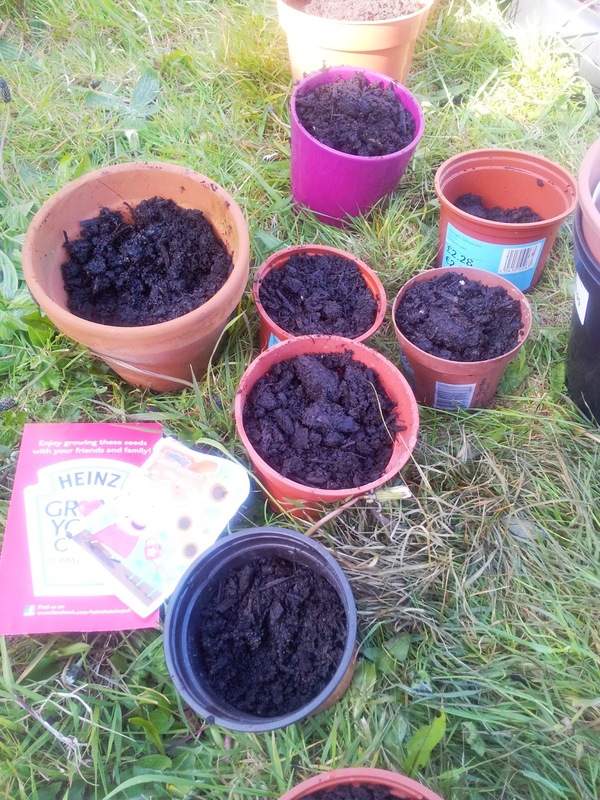 We planted lots of these while Izzy played with a new pot, putting soil in and tipping it out. 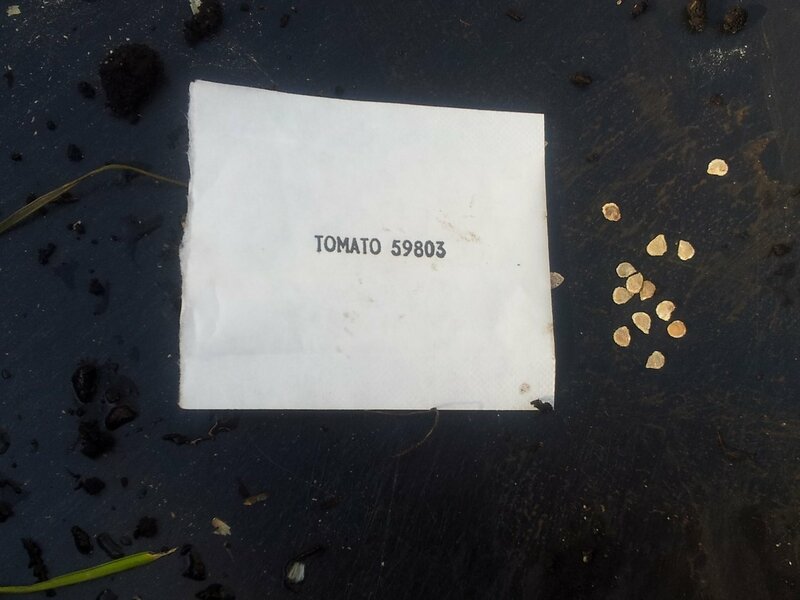 We then looked at the teeny tomato seeds. I gave the kids a tomato to eat, so they could see the seeds inside. 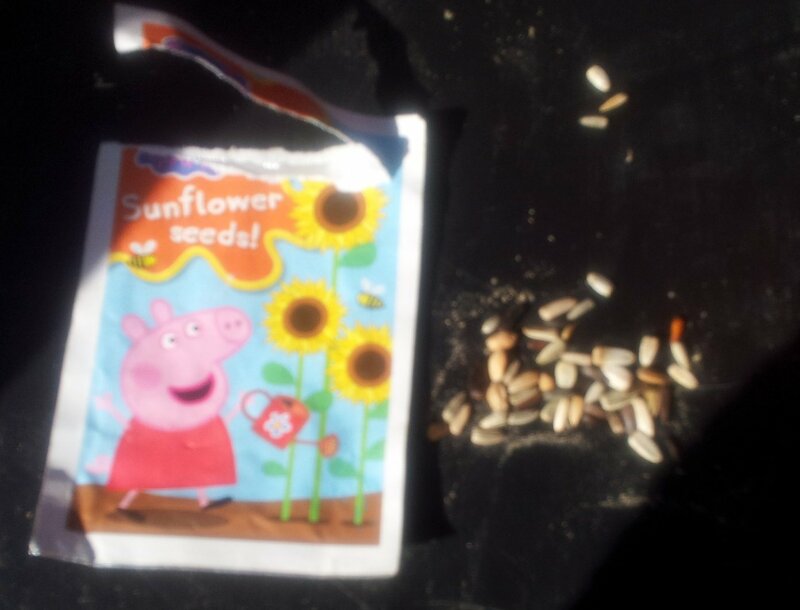 These seeds were sent to me free from Heinz. 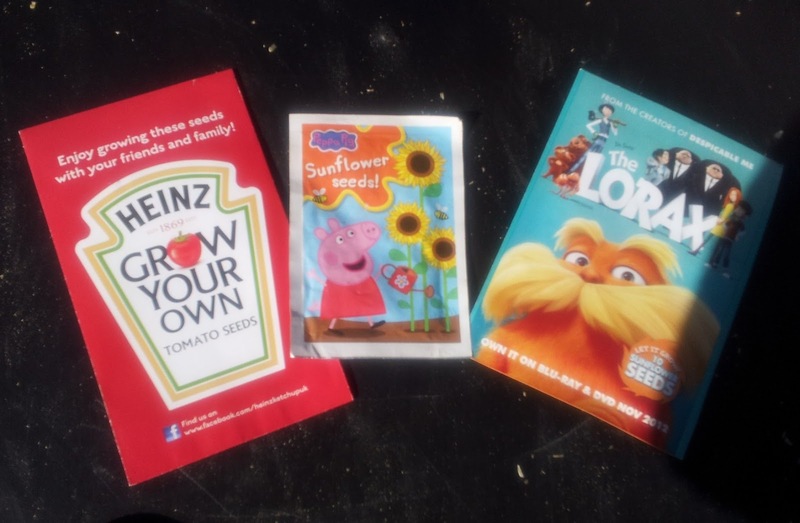 Just go to their Facebook Page to get your own free Heinz tomato seeds. 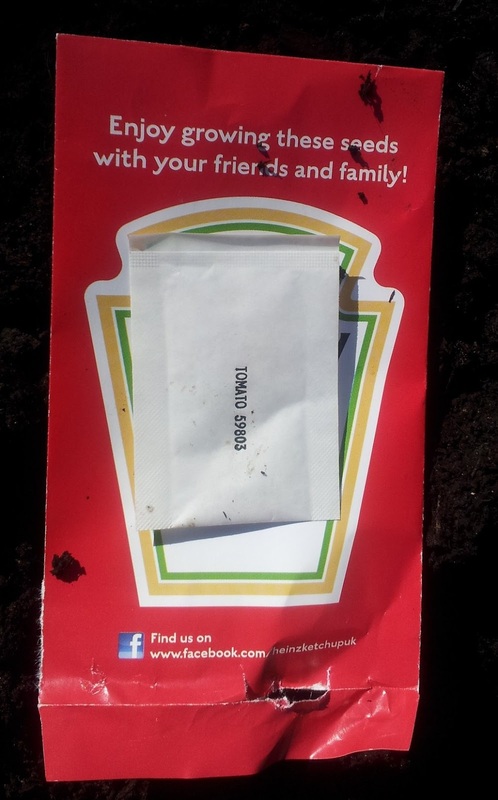 We planted our tomato seeds. We watered them again and I put all the pots away to germinate. 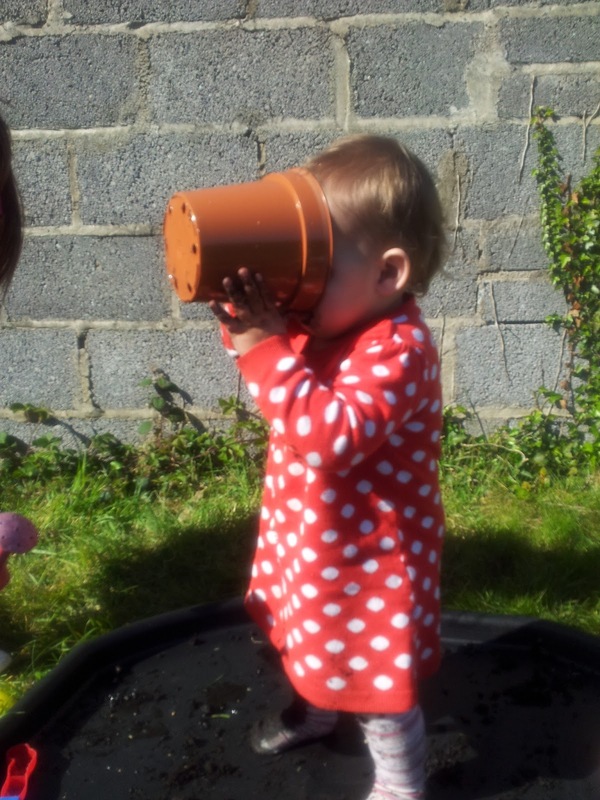 The watering can still works upside down! 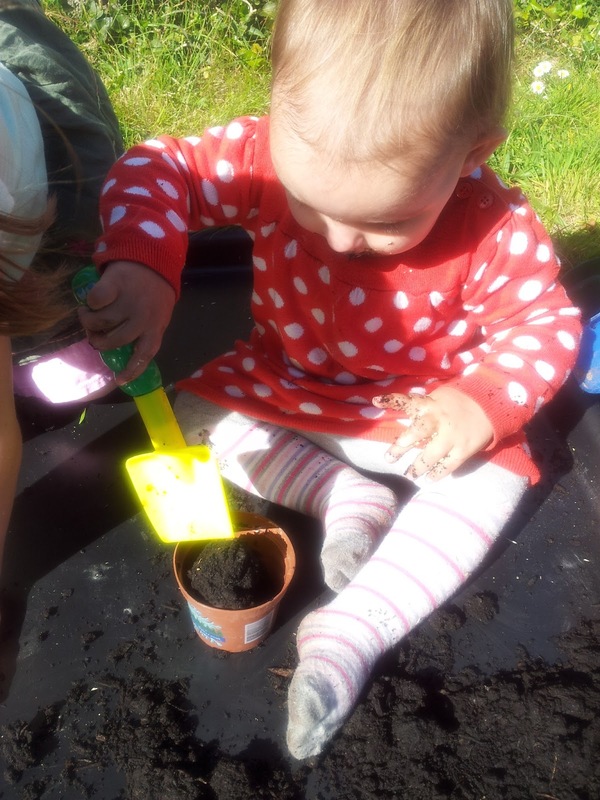 We were going to bring out our caterpillars and ladybirds to have a look at them during our messy play, we also had garden weeds and flowers ready to look at their different seeds, but Isabelle was ready to go inside. I gave her a nice hot bubbly, bath to wash off the wet mud and seeds. Then she climbed up on the settee for a cuddle with her tired big brother, Danny. They can be so cute together sometimes. 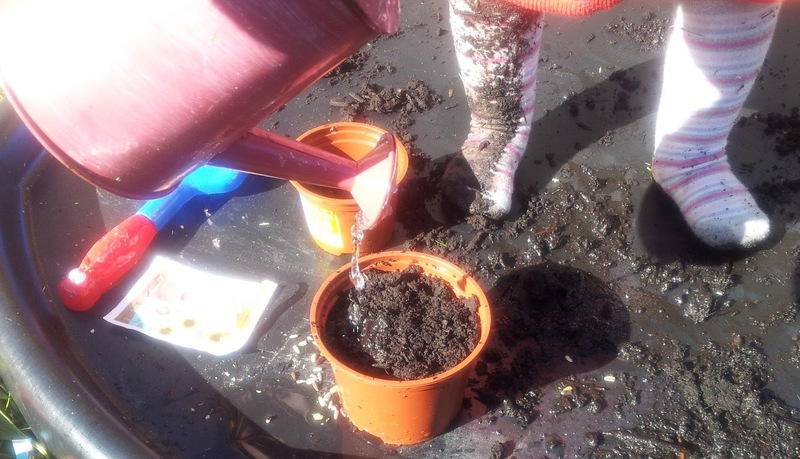 For more photos of this activity please take a look at my Google Plus Messy Play Planting Seeds Album. Next Post Mark Warner Active Family Challenge: Week 1: Spin!